Red Ted JUMPED up and ran over to our dining room table (were we paint) asking for a drum! I was stumped. 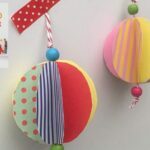 On the one hand I love, how he now associates books with crafts. Hurray for stART projects. On the other hand… expectations are begin to build… How to make?! Until… I remembered our formula tins (yes, sorry, we are formula household from around 4-5mths old). 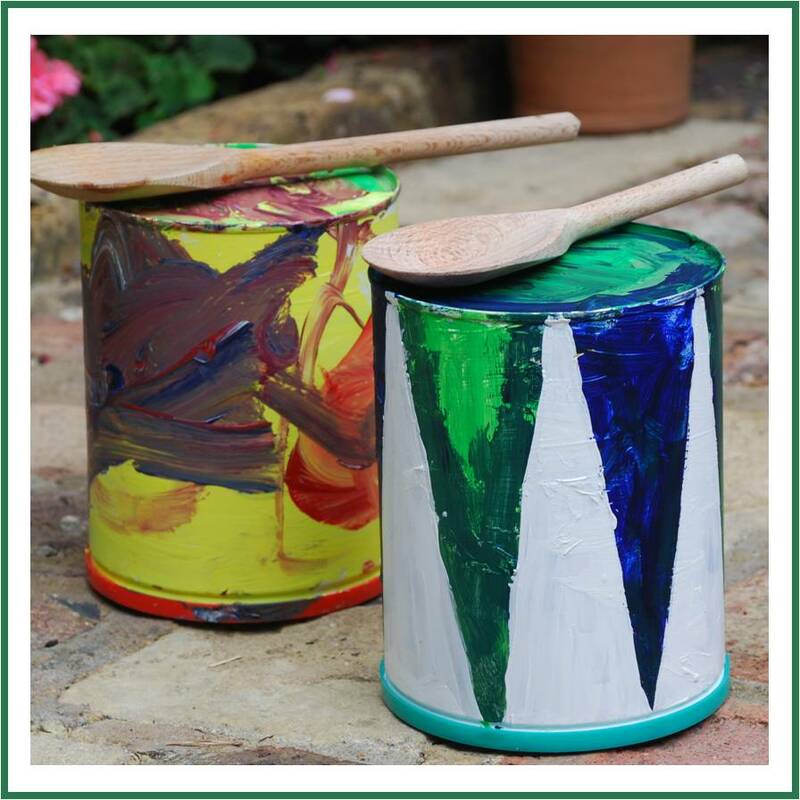 But you can do these with an old paint can or anything tin shaped with or with out lid, so long as it has no serrated edges! The first one – I gave Red Ted completely free reign – result a little brown. The second one (spot the hair cut!) – I did a base colour (white), then added masking tape triangles. Then gave Red Ted free reign with TWO colours. Blue & Green (& some white). We then pulled the masking tape off (some of the white paint underneath peeled a little, so we re-touched it). 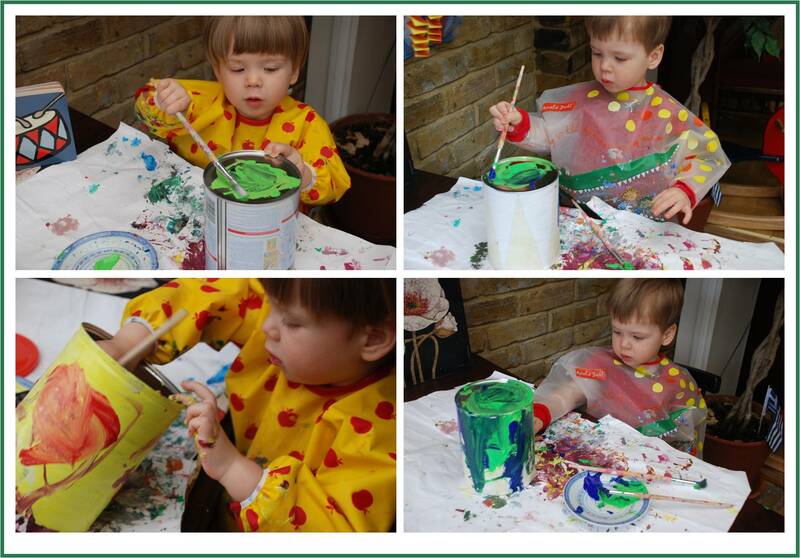 I have learnt that with 2.5yrs olds, if you give them ALL the primary colours you usually end with brown. So, do give them freedom, but with max. 2 primary colours and then it usually works! Even the neighbours 8yrs old had a go, which of course made it much more interesting again for Red Ted. Pip Squeak also had fun. The 8 yrs old was very good and “discovered” the different sounds you could make by hitting the edges, drumming on the lid versus the bottom etc… so we have a proper little instrument! 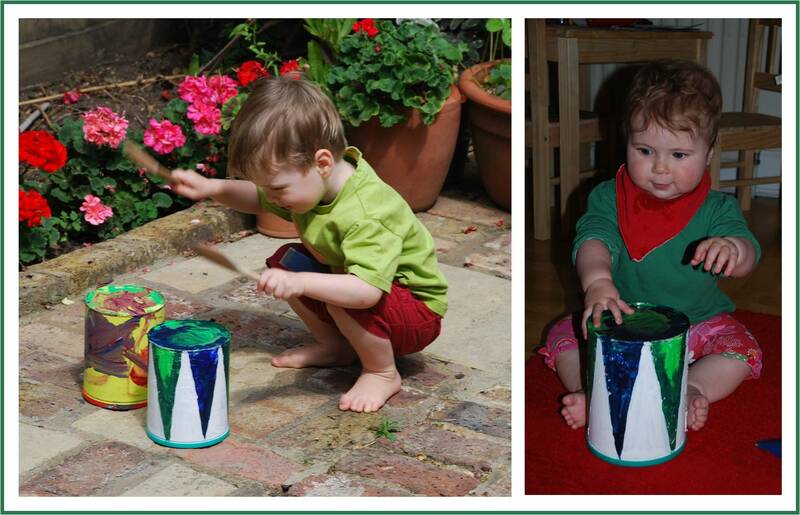 Needless to say, you don’t need to get crafty to have drums at home – pots, pans, tupperware are all marvellous percussion instruments! 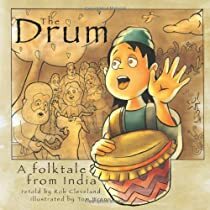 The Drum – A Folktale from India, produced by Welcome to the Story Cove. I thought that this was a great little book. I love folktales and if you think about it the Brother’s Grimm stories all started off as folktales. I also love books and stories from around the world. There is a reason why something becomes a folktale and it is usually that there is a wonderful lesson to be learnt and that the story itself is great. 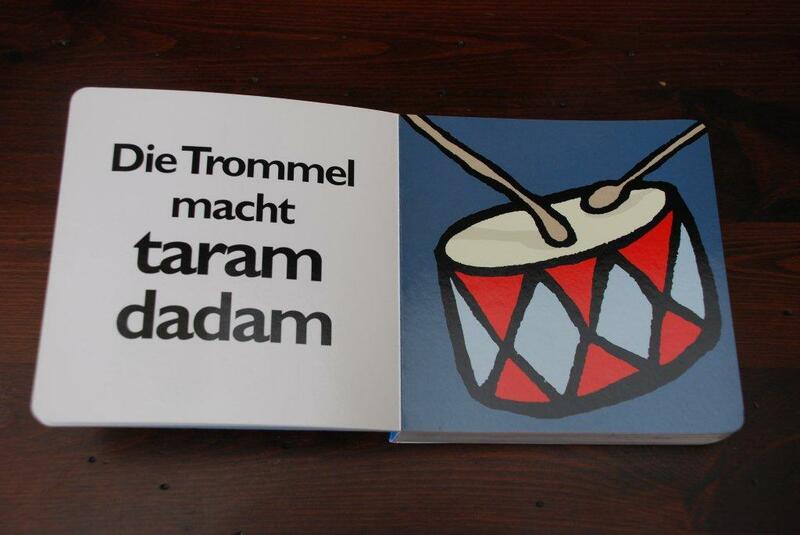 This the story of a little boy who is poor but wishes for a drum! All he is given is a “magic stick”, with the help of the “magic stick” and his own personal kindness and selflessness he indeed get’s his drum in the end. The story could have been written a little better and the drawings could be a little nicer too… but that is only, because we are spoilt by all those wonderful books available today. Red Ted likes the book and so do I. 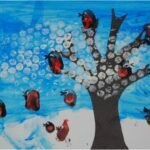 So look past the “non perfectness” and engross yourself in a folktale from India! 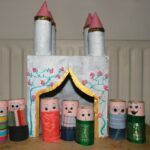 The Story Cove has other stories from around the world, which we will be checking out as well as website with lesson plans and activities, as well as previews: http://www.storycove.com/. Becoming a “member” is free. That’s fab! Love being able to learn from your ‘trials’! How fantastic! 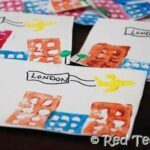 You could make a fortune getting these into schools & nurseries! Art & music! Fab! Ooooh, I never thought of that!!! You are so clever. You really are. Please don’t apologise for formula – you did what was best for your family. As a mum who was desperate to breast-feed and couldn’t for a variety of reasons, it makes me SO MAD when people smugly trot out the “breast is best” mantra. DD (who was formula fed from more or less the start) has just turned four, NEVER picks up any of the bugs at Nursery, is tall, sporty and beautiful and is also one of the brightest cookies I know (that’s not proud mama, that’s teacher talking…) whereas her friend, who was breast fed til she was one, picks up everything going as well as having developmental issues. The cliches are just that – cliches. a) a lot of this aggressive push is to reduce medical bills (in the UK, that has an impact on our National Health Service) Don’t mind that aspect – just don’t bully me because I’m not part of it. b) there is a disquiet growing among paediatric professionals that the “breast is best” mantra is being pushed to the point where some children’s brains are actually not developing as they should becasue they are undernourished ( this would have been the case with DD if I had persevered, and I still feel guilty about how long I took to accept it wasn’t happening for us) This was told to me by my health visitor, who gave the impression that she was flying in the face of acceptable practise – I was very grateful for her stepping out of line to do so. Anyhow, sorry about the rant. It just really bugs me that sensible women are made to feel bad about choices they make for the children they want the absolute best for. You keep going – you’re obviously doing a FAB job! Thank you “me35”! I know it is a very sensitive topic and I know I shouldn’t apologise… funny how you can’t “help yourself”. Do agree that the “Breast is Best” brigade are causing a lot of sadness and heartache for many mums, who want the best for the children and are made to feel they are not doing so if they end up opting for formula (through choice or no choice). Have seen a few friends really suffer because of this and it also makes me angry. Especially since a “happy mum” is a “better mum”. So if Bfeeding is causing problems or isn’t working for them or they just don’t want to do it, they shouldn’t be made to feel bad… anyway, you have said it all already! Thank you for taking the time to make such a long comment!!! This is a great idea and re-purposing old cans totally ROCKS! That’s right up my alley! Thanks for the tip! Fabulous! Love recycling/ re-purposing of things, so much fun! Perfect! Sounds like a fabulous drum to me!!! Am sure you parents were proud too! OH yes, love the fact that you know where they are!! So CUTE! 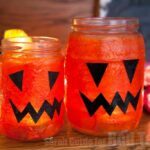 Great idea to mask it off for the little ones. I laughed at “all colors lead to brown” type of comment. We have the same issue. Off subject, but in general, I do think breast may be best. But not in all circumstances and there are plenty of very healthy people in the world raised on formula. I hate to see any mother feel bad about deciding formula or breast. I think everyone agrees that breast is best …if it’s possible in the multi-variables all families face. What makes it a problem is when people are made to feel so bad about using formula that they have to apologise in advance. Okay….deep breath ! I know this is my story and personal to me – but many mums who turn to bottlefeeding have their own stories, but people don’t see that, they just see “too posh too push” mums (yup. I had a c-section too) and judge on that. That’s the attitude that needs to change. Sorry about the SECOND rant – and thank-you Maggy for your personal response ( I’m a Margaret !!) Little Wonder’s Days, this is not a personal response to your comment – I totally agree IN GENERAL, and I wanted to explain how my experiences have shaped my opinion on this I’m afraid I am jsut the type of person who can’t let a challenge go by – and yes, it does make life difficult sometimes ! Hi Margaret!! A second (and third and fourth) rant is perfectly fine with me!!! Your experience sounds very very sad and stressful. Really impacts those precious first months with a new baby and I bet it feels like there was a cloud over what should have been a blissful bubble – which is such a shame! I think the UK needs to find a decent balance between the two approaches, which it doesn’t at the moment. And more help! That is what surprised me – all that “pushing” to bfeed, with not that much support.. mmmh. But the support should be balanced and put the health of BOTH the baby and mother first. Back to my “A happy mum = is a better mum” mantra! PS did you know Boots isn’t allowed to give reward points on infant formula for <1yrs old due to advertising laws? And you are not allowed to use your reward points to buy it either. Or at least not at my branch! Great craft! 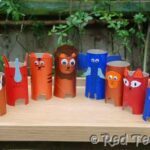 My girls take music lessons, so we’ve had our go at making drums out of oatmeal cannisters, etc. I’ve never heard of Story Cove books–thanks for the heads up! I love this idea. I have a pile of oatmeal containers that would make great drums. My post is going up tonight. Please stop by. There are so many great things to save from when they’re babies to use when they’re older. Ah, yes, the expectations being consistently crafty creates! My daughters are constantly asking what we’re “making today.” Uh…. your bed? 😉 Great drums! Thanks for taking the time to link this up today.. I love the drum you made. I really like how everything relates to a book.. Yeah for reading.. Thank you for joining WMCIR! We often end up with brown during open painting sessions, even though my daughter is almost 4. I like how your drums turned out. And thank you for the link to Story Cove – it looks like a great place for me to use as we travel the world. I hadn’t heard of Story Cove–I think I’ll look into it more soon. 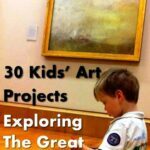 My friend, you come up with the most awesome art projects for your little ones! I’m always sooo impressed! I can see by reading a few of your comments that you are such an inspiration to many young mothers in search for creative ideas! Thank you so much! I’m so happy to have you join in with the fun of Sunday Favorites again this week!!! Love that drum!!! PS…I have a dear friend who is the our local public and school librarian. I am going to email your blog link to her. She does a monthly reading program for the little ones and also provides crafts, treats, etc. to coordinate with the book that she is reading! I think she will be elated to read your blog…you have so many great ideas!!! Oh Chari, thank you SOOO much for your lovely comment(s). I really do appreciate them and am chuffed to bits that you are referring my blog on to other crafty people as a resource! Thank you!!! Thanks for linking up at Feed Me Books Friday! We’ve made drums from baby cereal cans (similar to the formula size) oatmeal canisters, and our favorite is from an ice cream tub – I think its a 3 gallon plastic tub, tight fitting top, and a handle – great for marching. Also b/c the top is tight and sturdy, we store drumsticks, maracas, and whistles inside! We don’t have the big icecream tubs! They sound FABULOUS for bands and storge!!! I love your boy drums! I hope you will come participate in my link party! All About The Boy @ The Nifty Nest! Great idea! I love the drums! Those are so fun!! Thanks for the idea! Love the combination of music & art – my 2 passions! (well, dance actually). 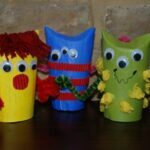 Lovely Maggy, and perfect for the Music and Song Play Carnival – thanks for sharing with us. These drums look like so much fun! This is a great idea, to use a large paint can for a drum; it’s just the right size and looks very nice when painted with a design.